This critical reader, specifically designed to accompany the anthology, contains twelve original essays - ten newly-written - on a wide range of topics, together with an introductory overview by the editor. Karen L. Kilcup is Professor of American literature at the University of North Carolina at Greensboro. The recipient of a US national Distinguished Teacher award in 1987, Professor Kilcup has been named the Davidson Eminent Scholar Chair in the Humanities at Florida International University for Fall 2000. She is the author or editor of six books on American literature and culture, including Soft Canons: American Women Writers and Masculine Tradition (1999), Robert Frost and Feminine Literary Tradition (1998), and Nineteenth-Century American Women Writers: An Anthology (1997). 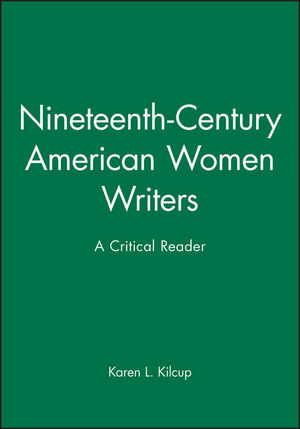 Introduction: A Conversation on Nineteenth-Century American Women's Writing: Karen Kilcup. "Not in the Least American": Nineteenth-Century Literary Regionalism as UnAmerican Literature: Judith Fetterley (University at Albany, SUNY). Living With Difference: Nineteenth-Century Southern Women Writers: Nancy A. Walker (Vanderbilt University). Western Biodiversity: Rereading Nineteenth-Century American Women's Writing: Melody Graulich (University of New Hampshire). "A Tolerance For Contradictions":The Short Stories of Maria Cristina Mena: Tiffany Ana L¢pez (University of California, Riverside). Early Native American Women Authors: Jane Johnston Schoolcraft, Sarah Winnemucca, S. Alice Callahan, E. Pauline Johnson, and Zitkala-a: A. LaVonne Brown Ruoff (University of Illinois, Chicago). Nature, Nurture, and Nationalism: "A Faded Leaf of History": Jean Pfaelzer (University of Delaware). Crippled Girls and Lame Old Women: Sentimental Spectacles of Sympathy in Nineteenth-Century American Women's Writing: Rosemarie Garland Thomson (Howard University). Fracturing Gender: Women's Economic Independence: Joyce Warren (Queens College, CUNY). "To Labor. . . And Fight on the Side of God":Spirit, Class, and Nineteenth-Century African-American Women's Literature: Barbara McCaskill (University of Georgia). "Essays of Invention":Transformations of Advice in Nineteenth-Century American Women's Writing: Karen L. Kilcup (University of North Carolina, Greensboro). Inventing a Feminist Discourse: Rhetoric and Resistance in Margaret Fuller's Women In The Nineteenth Century: Annette Kolodny (University of Arizonia). Nineteenth-Century American Women Poets Revisited: Cheryl Walker (Scripps College). Provides key readings relating to texts in Kilcup's anthology. Offers twelve essays and an overarching introduction. Constitutes an important revisionist contribution to nineteenth-century American literary study.